Fact Check: Are young people being priced out of living where they grow up? The government are now on-course to meet their original debt target, with net debt as a share of GDP falling in 2015-16. What's changed since December? The post Why is net debt falling as a share of GDP? appeared first on Full Fact. "Older people could reduce risk of osteoporosis by hopping for two minutes a day," the Daily Mirror reports. A UK study found regular hopping increased bone density in older men. The study assigned more than 30 healthy older men to exercises on one leg and compared the change in bone density with the other leg. It found five sets of 10 hops, with a 15-second rest between each set, every day increased the density of some parts of the hip. The men, aged 65 to 80 years old, were followed up with a second scan after 12 months. Some of the media claim this has major implications for the prevention and management of osteoporosis. But these findings were from a group of healthy older males without osteoporosis and no other health conditions. It is unclear whether hopping would be effective, and safe, for people who actually have osteoporosis. The follow-up time was also relatively modest – just 12 months – so it is uncertain whether this exercise regime would prevent bone fractures in the long term. Women feature in many of the newspaper pictures, but were not participants in this study. Ways to prevent osteoporosis include weight-bearing exercises. For people aged over 60, this can include brisk walking. Read more about bone health. The study was carried out by researchers from Loughborough University, the University of Cambridge, University Hospitals Leicester, and Derby Hospitals NHS foundation Trust. It was funded by the National Osteoporosis Innovative Award, a Medical Research Council UK Interdisciplinary Bridging Award, and a Loughborough University Scholarship. The study was published in the peer-reviewed Journal of Bone and Mineral Research. This study has been widely reported in the UK media, with many sources suggesting hopping reduces the risk of a fracture. This was not reported in the paper and it is not yet known whether the bone density improvements demonstrated led to reduced numbers of fractures. This randomised controlled trial aimed to evaluate the effects of these exercises on cortical and trabecular bone (found in the hip) and its 3D distribution across the hip. This study design is the best way to assess such an effect, but as it was only the participants' legs that were randomised in this instance, both legs may have benefited from changes to other behaviours. Researchers recruited 50 healthy men of European origin who were aged 65 to 80. The men had no involvement in exercises of a strength, power or weightlifting nature for more than one hour a week, and had no health conditions likely to influence bone, neuromuscular function or their ability to perform exercises. The "exercise leg" of each participant was randomly assigned (left or right) using sealed opaque envelopes. Limb dominance had no effect on allocation. All participants were to perform hopping exercises on their exercise leg only and avoid any other changes to their physical activity or dietary habits during the trial. The hopping exercise involved around 10 minutes of activity and consisted of five sets of 10 hops, with a 15-second rest between each set. This was performed in a variety of directions. Exercises were to be performed as high and fast as they could on a hard, even surface, while barefoot and when another person was nearby. Measurements of bone mineral content were taken by CT scan before and after the study period. This was performed by a radiographer who was unaware (blinded) to leg allocation and efforts were made to standardise leg placement. Researchers were interested in how the exercise affects different parts of the hip. Participants were to complete a seven-day food diary and health and physical activity questionnaire before the trial began. Anthropometric measurements (height, weight and BMI) and body composition were taken by DEXA (DXA) scan before and after the trial period. The men were followed up after 12 months. Of the 50 men who started the trial, only 34 remained for analysis. The withdrawal rate was 32% (16 men). This was mainly because of either health problems unrelated to the intervention, time commitments or discomfort during exercise. The study found bone mineral density in the outer and spongy layers significantly increased over time in each leg. The density of the outer layer increased significantly more in the exercise leg, compared with the control leg. There was a greater increase in density in the exercise leg than the control leg in terms of where the femur connects to the hip bone. Instability of the hip was reduced more in the exercise leg. The researchers state short bursts of regular hopping exercises increased hip bone density, and exercise that targets localised regions of the proximal femur (the section of bone that connects the upper thigh bone to the hip) could produce greater increases in bone strength and resistance to fracture. This was a randomised controlled trial assessing the effect on hip bone density of hopping as a form of weight-bearing exercise in older men. The study found the hopping exercise to be of significant benefit to certain parts of the hip. But this study was performed in healthy men with no health concerns. The study had a number of strengths and limitations. Strengths are that it was randomised in design, and the fact there was concealed allocation to the intervention group and blinded assessors, reducing the risk of bias. The researchers also performed calculations to estimate the number of participants needed for their study. Limitations are that the study may have benefited from having a control group who did not take part in the hopping exercise, rather than just a randomly assigned leg. In addition, the sample size was quite small, the study did not assess physical activity or dietary habits after the intervention, and it was conducted in a group of healthy older men. This means the findings may not be generalisable to other groups, especially those with osteoporosis, where boosting bone density would be of great benefit. While this study has presented some significant findings, it is not possible to say whether this intervention would be of use to other older people who have health issues or are perhaps unsteady on their feet. The high drop-out rate of 32% suggests it may not be a suitable exercise for many men. If you do have osteoporosis, hopping may not be the ideal exercise plan for you as there is a risk of falling, which could result in fracture. Your GP or the doctor in charge of your care should be able to recommend a suitable exercise plan. South African president Jacob Zuma is due to deliver his eighth State of the Nation Address in parliament on Thursday. Last year he delivered two State of the Nation Addresses – one before and one after the country’s national elections in May. This report looks back at the claims he made about the economy. The post 2014 SONA claims revisited: Zuma on land reform appeared first on Africa Check. The post Election update, 19 April: big interviews and a mixed offering appeared first on Full Fact. After the recent outbreak of xenophobic violence in South Africa The New York Times wrote that 5 million immigrants call South Africa home. Available data suggests that this is an exaggeration. The post Do 5 million immigrants live in S. Africa? The New York Times inflates number appeared first on Africa Check. The post Non-EU immigration: down by 13%? appeared first on Full Fact. School performance of disadvantaged pupils has, for the most part, been improving. The trend is less clear for the gap between these pupils and their peers. The post Is the performance of disadvantaged pupils improving? appeared first on Full Fact. The post Partner visas and the EU appeared first on Full Fact. The historian Richard Hofstadter wrote a still widely read 1964 essay for Harper’s Magazine outlining what he called the “paranoid style” in American politics. Marked by “a sense of heated exaggeration”, suspicion, and wild fears of political conspiracy, it was, he argued, a common part of American political life. It dated back to the rise of the antislavery movement before the Civil War, and every so often, it resurfaced at times of national crisis. Hofstadter was alarmed to see this way of thinking infuse the politics of his own time. One example was the “Red Scare”, a series of anti-communist investigations and purges led by Senator Joe McCarthy. And then there was Barry Goldwater, the Republican party’s 1964 presidential nominee. 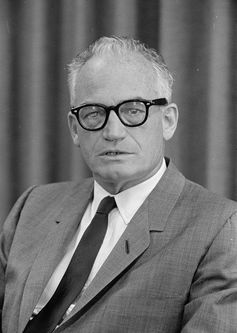 Goldwater, a senator from Arizona, was an outsider in the Republican party, known for his staunch anti-communism and opposition to the Civil Rights Act. He surprised everybody by beating the better-known and more moderate Nelson Rockefeller to become the party’s choice for president. Goldwater picked up support from conservative voters who feared their role in society was under threat – that the fast-changing US was being taken away from them and their kind. “Traditional American values” were being undermined by left-wing intellectuals; the country was in danger, under threat from communist aggression abroad and Soviet spies and sympathisers at home. Barry Goldwater. Marion S. Trikosko via Wikimedia Commons. Mainstream political leaders didn’t understand these fears, or simply chose to ignore them. But Goldwater did understand, and he won over grassroots activists by speaking directly to their concerns. Goldwater was admired by Republican activists, but the wider electorate considered him beyond the pale. In the November election, he was crushed by the incumbent Democratic president, Lyndon Johnson. Nonetheless, Goldwater’s campaign fundamentally changed the thinking of his party – and five decades on, the conditions that led to the rise of Goldwater are on full display once again. In his 1964 essay, Hofstadter argued that the paranoid style tends to resurface when class, ethnic and religious conflicts come to the fore. All three are roiling the US today. The gap between the political elite and middle- and working-class Americans is as wide as it’s ever been. The uncertainty that set in after the economic crisis of 2008 endures; it has left workers deeply anxious about jobs and wages – and they fear labour competition from immigrants, especially Mexican ones. Internationally, the rise of radical Islam has threatened American interests abroad – and a series of "home-grown” extremist terror attacks have only reinforced the image of a nation under threat. Mainstream politicians have been slow to respond, but like Goldwater before him, Trump has seized the moment. He has promised to build a wall on the border with Mexico, keep out Muslim immigrants and cancel free trade agreements to protect American jobs. As for the rest of the world, he has promised tough measures to wipe out the so-called Islamic State and has talked particularly tough on China. As a self-proclaimed crusader against a corrupt political establishment, Trump has promised to see Hillary Clinton thrown in jail. He will “drain the swamp” to clean up the political system. As Hofstadter put it, the paranoid style of mind creates “heroic strivings for evidence to prove that the unbelievable is the only thing that can be believed”. Sure enough, many of Trump’s supporters apparently see their candidate as a knight in shining armour who can do no wrong. From this standpoint, attacks on his campaign aren’t grounded in reality or motivated purely by political differences; they are the work of a political conspiracy. “Crooked Hillary” is a “nasty woman” rather than a political opponent with a different vision for America. The election is being “rigged”, and Trump will only accept the result if he wins. Trump has successfully cultivated an image of martyrdom, which goes a long way to explaining why he has survived myriad allegations of personal misconduct that would have destroyed any normal campaign. To his devotees, accusations of tax evasion and scamming are over-egged or false, while the women who have accused him of sexual harassment are lying gold-diggers bankrolled by the Washington establishment. So while Trump may seem like an anomaly, his campaign is in fact a constellation of familiar themes pulled together at a particularly fraught moment in US history. And candidates like this have won before. In 1980, Ronald Reagan, another ideologically conservative Republican outsider, was elected president. 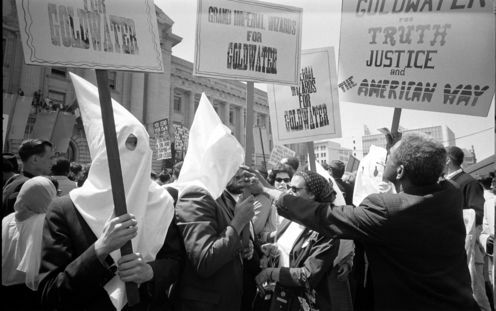 To some on the right, Reagan – who spoke in Goldwater’s favour at the 1964 convention – represented the ultimate vindication of Goldwater’s vision. The thread connecting the three candidates was on full display in Reagan’s convention speech in 1980, where he pledged to “make America great again”. It remains to be seen if Trump will enjoy the success of Reagan or go down in flames like Goldwater. Either way, Hillary Clinton should understand his political appeal as well as anyone: in 1964, aged just 17, she campaigned for Goldwater herself. Kevern Verney was a co-investigator for the Barack Obama Research Network, 2010-2014, funded by the Arts and Humanities Research Council (AHRC). Three claims about Sure Start Children's Centres and the facts behind them. The post Childcare predictions get off to an Unsure Start appeared first on Full Fact. With four months still to go until the polls open, the parties are already vying for our votes. We look at the claims made on their new campaign posters. The post Factcheck: Campaign posters don’t show the full picture appeared first on Full Fact. The post Election update, 21 April: nurse training and a row over the SNP appeared first on Full Fact. The post What counts as being able to read, write and add up properly? appeared first on Full Fact.